Hurt in an Escalator Accident? In the news, you occasionally see horror stories about faulty escalators causing serious injuries – but that's the last thing you think about when you're stepping onto one. Sadly, our attorneys have seen those horror stories become realities for some of our clients. We have years of experience fighting for accident victims, and with escalator accidents, we have found that most of the time it's not the victim's fault but rather the building management or escalator maintenance company is to blame. In one situation, we successfully obtained a confidential settlement for a client whose foot was severely injured by an improperly maintained escalator. Not only did our client suffer traumatic physical injury, they also suffered longer-term psychological effects. Upon investigation, our attorneys and legal teams found that several wrongs were committed by building management. If you or a loved one was hurt in an escalator accident, the building management or their insurance company may be telling you that the accident was your fault, when you know it wasn't. It can be easy for a company to claim you were at fault for your escalator accident, especially when you're not an expert. They can claim that it was your clothing that forced you to get stuck, that you weren't using the escalator correctly, or that they're not at fault because the escalator meets safety code minimums. That's where our experienced legal teams can help. We know where to look. We know escalator safety code, and we've seen where building management has cut corners before. We have a track record of success, and big, complex cases don't scare us. What Caused Your Escalator Accident? There are different reasons why escalator accidents happen, and each time, they can cause devastating injuries. In the case of our client we mentioned, it could've seemed as if they put their foot in an "unsafe" position riding down the escalator. But after we investigated, we found that wasn't the case at all and that the escalator accident was 100 percent preventable. Unfortunately, it can take a long time for safety laws to catch up to new technology and research. For many machinery, like escalators and elevators, some older models are "grandfathered in," and are not subject to new safety code. 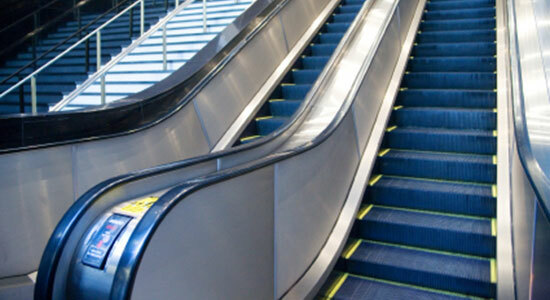 Our legal teams also frequently find that companies do not take the time or contribute the money necessary to make escalators safer than the minimum requirements. With the escalator that caused our client's injuries, we found that it did not have yellow caution paint on either side, warning where not to place your foot. While this was not necessarily required, we visited buildings of the same owner and found that their escalators did have that caution paint – meaning that the location of the accident was surely able to have painted those lines. We believe that just because an escalator meets minimum safety requirements, it doesn't mean the escalator is safe. On that same escalator, we found that many parts were worn or even missing. As a result of this ongoing poor maintenance, certain parts were slowly pushed out of the way, creating a gap – and that's ultimately what caused our client to become trapped. We also found that there was no expert escalator maintenance company employed – something that many owners buy into to prevent escalator accidents like this. Sadly, our attorneys and investigators often find that building management prefers to save time and money, instead of taking care to properly fix and maintain escalators. When corners are cut to save money, accidents are bound to happen, and management could be responsible for your injuries under premises liability. It's easy for building management to bring in an expert or a maintenance company to do escalator safety testing. As if our client's accident needed any more wrongdoing, our investigations team and expert found that had building management done thorough and proper testing, this escalator's issues could have been solved beforehand. If you try to argue that your escalator accident wasn't your fault, you can soon face a large company, and it can be hard to argue your position when you're alone. The same goes for some attorneys – often times, we see great attorneys take on cases like this, but find that they don't have the manpower, available finances, or expertise to argue your case to its potential. As soon as our client chose us to be their attorneys, we immediately worked to file what's called an "emergency injunction," which prevented the building from restarting the escalator. Had management done this, crucial evidence might have been lost. At Edgar Snyder & Associates, through experience we have learned how fast scenes can change, and we know exactly the steps we must take to preserve evidence.